The default Debian Linux installation CD/DVD may not contain proprietary firmware (drivers) for your hardware. 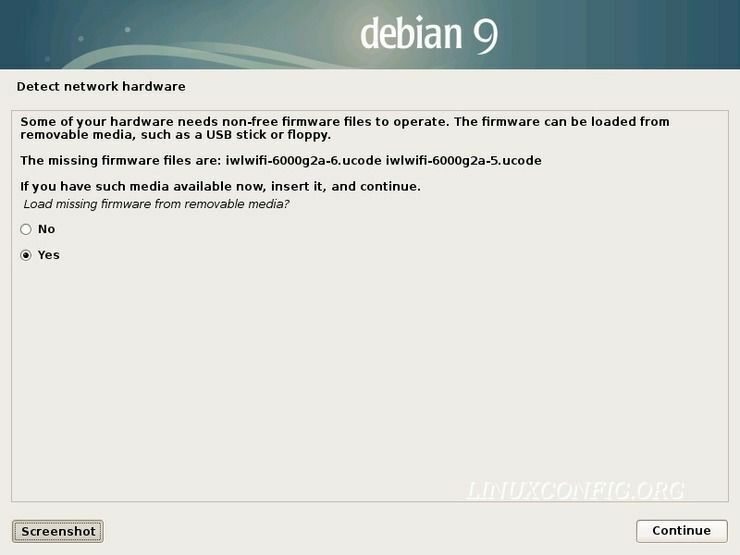 From this reason, it is up to the user to load this non-free firmware during the Debian Linux installation. This article helps you to prepare your removable media to load missing firmware during the Debian Linux installation. USB drive or other removable media such is SD card etc. Use your favourite partitioning tool to create a new FAT32 partition on your USB drive. Alternatively, use the bellow command to to automatically create a single partition on your USB drive marked for the FAT32 filesystem. Be warned that the below command destroys all data on your removable media. Furthermore, be sure to supply a correct block device name argument to avoid accidentally destroying other disk also attached to your system. Once the new partition is ready, create a FAT32 filesystem. Lastly, mount your USB drive to eg. /mnt/tmp mount point. At this stage, we can download and copy the missing firmware onto a USB drive. Use wget to download and tar command to extract the non-free firmware onto your USB drive. Replace VERSION string with the Debian's code name you are about to install. Now insert your USB disk containing all non-free firmware into your PC and you are ready to continue with your Debian Linux installation.